The City of Lawrence cares about our residents and wants to ensure conditions in their homes are safe and habitable. As of January 1, 2015, all residential rental properties are required to have a valid rental license and periodic inspections. As a tenant, we want you to know about the licensing program and how this program will affect you. The Rental Licensing and Inspection Program requires interior and exterior inspections of dwelling units to ensure minimum code standards are met to protect the life, health, safety and the general welfare of occupants. You may contact the Code Enforcement Division at (785) 832-3345 to inquire if your dwelling unit has been inspected as part of the program. Dwelling units are inspected on a periodic schedule based on 10% of all dwelling units owned by a landlord therefore your dwelling unit may not be inspected during your tenancy. In absence of a required inspection by the City, we recommend tenants work with their landlord to address maintenance issues that need to be corrected. If these issues remain, you can request an inspection of your dwelling unit at any time if you believe your dwelling unit is not maintained to meet the minimum property maintenance standards as set forth in the city’s Property Maintenance Code. 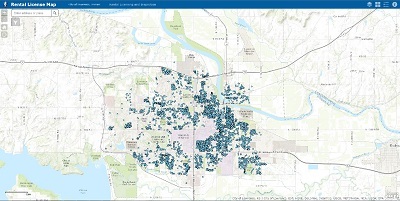 View the interactive map of active rental licenses. Will the city inspect my rental unit? Yes, typically on a 3-year cycle. The city works with the landlord, property owner, or agent of the owner to schedule inspections when they are required. As the tenant, you will be asked to sign a consent form allowing the inspection. Your landlord may choose to be present while the city performs the inspection. Are windows and exterior doors in working order? Are there structural defects to the foundation, stairs, exterior decks, balconies, etc. Are there large patches of mold? Does the unit have minimum food preparation and cooking areas? Are the heating, plumbing and electrical systems operational and functioning correctly? Is the sanitary sewer line functioning? Are escape windows operable and meet safety requirements? Does the unit have a fire extinguisher and is it operable? Are any exterior structures (garages, sheds, etc.) in structural danger of collapsing? Does the unit comply with the occupancy guidelines for the zoning of the area? What is the city looking for during inspections? The inspection is narrowly focused to ensure that the dwelling unit is in compliance with the minimum property maintenance standards established by the Rental Licensing Ordinance as well as the city’s Property Maintenance Code and Land Development Code. A list of items, ranging from functioning smoke alarms, plumbing, heating/cooling system functionality, electrical safety, minimum property maintenance requirements, occupancy requirements, structural safety and other standard fire safety measures, is included in the inspection. A full checklist is available at our website: lawrenceks.org/pds/rental-licensing. Will the inspector make video recordings or take photographs during inspections? Generally, the Rental Inspector will not make video recordings or take photographs. The Inspector is there to inspect and document Rental Program violations or Property Maintenance Code violations only, and video or photographs are generally unnecessary. Only in cases where an extreme life safety issue or immediate hazard exists, or where compliance by the owner or tenant is not making progress, might a photograph be taken, and usually with the tenant’s consent. Can a tenant be cited for a violation? Yes, if it can be determined that the tenant is the cause of a Rental Program violation, a Notice of Violation may be issued to the tenant instead of to the owner. What is an occupancy requirement? Dwelling units located in (RS) Single-Dwelling Residential zoned districts are permitted to be occupied by a family unit that is related by blood, marriage or adoption or by no more than three-unrelated persons. All other dwelling units located in non-RS zoning districts are permitted to be occupied by a family unit that is related by blood, marriage or adoption or by no more than a group of four-unrelated persons. Effective August 1, 2015, all detached dwelling units (houses) located in zoning districts other than Multi-Dwelling Residential (RM) will be permitted to be occupied by a family unit that is related by blood, marriage or adoption or by no more than three un-related persons. Occupancy limits shall not apply to the following uses: Congregate Living, Dormitory, Fraternity or Sorority House, Group Home (General or Limited), Motel, Hotel, Extended Stay, and Bed and Breakfast. What happens if my rental unit is found to have violations? The city will issue their findings in writing to the property owner, landlord or owner’s agent. Some violations may be able to be corrected on-site during the inspection. The owner will have a period of time, typically 30 days, to correct violations. If a noted violation poses an imminent threat to life, safety or health (such as an unvented gas appliance, dangerous electrical wiring or a collapsed/backed up sanitary sewer line), the city may require correction in less than 30 days. Can I find out if my rental unit has been cited for violations? Yes, your landlord is required to keep a record of rental licenses. You can contact the city at (785) 832-3345 to inquire about a specific property’s licensing history. What if I suspect there are violations in my rental unit during a year when an inspection is not due? Can I submit my concerns for inspection? Yes, you can report a code concern or complaint at any time by emailing rentallicensing@lawrenceks.org or calling our office at (785) 832-3345. Does my landlord have to post the rental license at each residence? Licensees are not required to post copies of the license in dwelling units, on buildings or on residential property premises. However, the city requires that rental licenses be maintained by the owner/owner agent on the rental property premises, if possible, or at the licensee’s principal place of business, and be made available, upon request, to any tenant of a dwelling unit or to a City code official. Do I have to allow the inspection? You have the right to refuse consent to inspect, however, if you do refuse consent, the city may seek an administrative search warrant or other lawful means by which to complete the inspection. How will tenants be made aware of the Rental Licensing Inspection Program? Each September the city will mail a postcard to each licensed dwelling unit. The postcard will provide residents of the dwelling general information about the Rental Licensing Program and relevant contact information for reporting to the city any suspected violations of the City Code. Please contact the city staff either in-person, email or by phone. Planning and Development Services is located at 1 Riverfront Plaza, Suite 110 in downtown Lawrence. The main Rental Licensing phone number is (785) 832-3345 or email us at rentallicensing@lawrenceks.org.